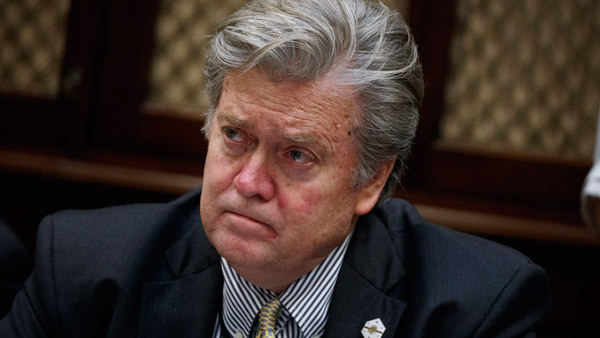 WASHINGTON -- President Donald Trump has removed chief strategist Steve Bannon from the National Security Council, reversing an earlier, controversial decision to give Bannon access to the high-level meetings. Trump's first national security adviser, Michael Flynn, was at the helm of the NSC at the time, but the official said Bannon's role had nothing to do with the troubles facing Flynn, who was asked to resign in early February for misleading the administration about his communication with Russian officials. Flynn's replacement, Lt. Gen. H.R. McMaster, was given free rein to reorganize the NSC as he saw fit. McMaster immediately expressing a desire to run a less hierarchical organization and be more accessible to his staff, something that created widespread frustration when Flynn was in charge, according to three current and former administration officials familiar with the changes. As a participant of the Principals Committee, Bannon would have had the authority to call a vote if the president's vision for the NSC was not being implemented. The committee, which includes top officials from various government agencies, meets regularly to address important policy issues. The official said Bannon's removal from the NSC was not a reflection of any change in his standing as one of Trump's closest advisers. Bannon will maintain his security clearance as is standard for most top West Wing officials. The New York Times last week identified two NSC officials as having helped House intelligence committee chairman Devin Nunes view secret reports. A U.S. official confirmed to The Associated Press that Ezra Cohen-Watnick had access to those kinds of intelligence materials, but maintained he did not play a role in helping the congressman gain access the documents. The official pointed instead to the other official named in The New York Times report, Michael Ellis, a White House lawyer who previously worked for Nunes on the House committee. The officials spoke anonymously because they were not authorized to discuss the changes or other details that have not been formally announced.